This clever array of nesting boxes keeps your favorite accessories neatly organized. Part treasure chest and part puzzle box, this clever design keeps your favorite accessories neatly organized. 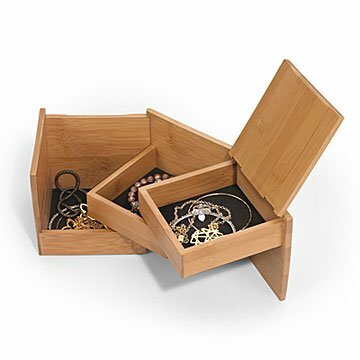 Three nesting boxes offer options for earrings, bracelets, and other small pieces, cleverly hinged to hide away in a single, space-saving bamboo cube. The compact, contemporary design is a smart dresser-top option for small spaces. Made in China. I love the simplicity of design, and as I don't have much jewelry it has ample storage. Has a lot of storage space and doesn't look like a jewelry box. Bought this for my daughter who lives in a college dorm. She loves it because it looks great and she can "hide" her jewelry in plain sight.